Over the last year, I've been trying to be a little more crafty. I learned how to crochet. I've gotten back to sewing a little. I even bought a Cricut. With the Cricut came the idea to get into scrap booking. I have made a couple as gifts for other people and found I really enjoyed it. Imagine my surprise when I got an email from Liz at My Memories, the digital scrap booking company asking if I would like to do a review and giveaway of their scrap booking software. The answer to that question was a no brainer. "Yes, please" was my answer, of course. I didn't have any experience with scrap booking software, so I didn't really know what to expect. What I didn't expect was to be blown away by all the things you can do with this software. I am amazed by all the choices you have. There are templates you can use, but you can create your own with ease. Below are pictures of two pages that I made when I was playing with the program. It was fun to look through all the things the program has to offer. There are all kinds of background papers, word art designers, embellishments and shapes to name a few. This is just a small sampling of what you can do with My Memories software. I can't wait to really get into it and start a real scrapbook. So far, I have just been playing around. The real fun will start when I get serious with the program. Believe it or not, you can even make photo books, cards, videos, you name it! Now comes the fun for all of you. 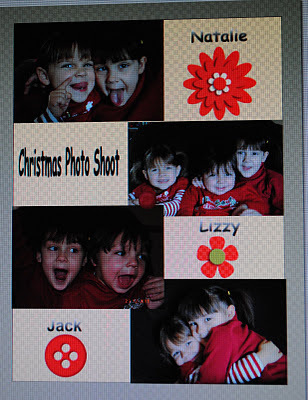 Liz has offered to give one of you a chance to win your very own My Memories digital scrap booking software kit. Mandatory entry will be to go to My Memories and check out the site. Then come back and leave me a comment telling me your favorite paper pack or layout. 1. Follow the My Memories blog. 2. Follow My Memories on Facebook. 3. Follow My Memories on Twitter. 5. Follow my Facebook page. Now, you have eight ways to enter. But....if you can't wait to see if you win, Liz has a great offer for you. As a special for all of my readers, Liz gave you your very own Share the Memories code that provides a $10 discount off the purchase of the My Memories Suite Scrapbook software and a $10 coupon for the My Memories.com store - $20 value! Your promo code is STMMMS47642. Just go to My Memories and use the code. I will pick a random winner on February 13th. Good luck everyone! I love the Martial Arts Pack ! I could use it for all of Luke's Tae Kwon Do pictures and upcoming tournaments. What a fun giveaway, I've been wanting to try digiscrapping - my friend Trish sent me over to check you out. I love the Magical Memories kit - we are leaving the end of this week for Disney World and this would be perfect for that! I asked to follow you on my twitter feed. I really liked the Grandma's Pockets quick page. I've always wanted to try digital scrapbooking so this is great! I added you to my reader. Is that the same as following, LOL? And I already follow you on Twitter! I love the dotty4you pack.. I am following your blog now~ this software looks really cool. I like the Frosted pack. We are already Facebook friends. Every single line is full of meaning and kind of need for coming future. This blog is so much necessary for the related people. Really helpful for those who read it as me and very thanks to u for posting it. Best of luck.